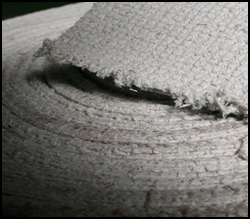 Asbestos Cloth : Asbestos Cloth, Asbestos Cloth Manufacturers, Exporter of Asbestos Cloth, Supplier of Asbestos Cloth, Ceramic Cloth. Asbestos Cloth is for manufacture of fire-resistant gloves, suits and other clothing for fire fighting. Asbestos Cloth is Also for heat-resistant gloves, aprons etc. Using as safety curtains in theatres, ships and aircraft and wherever a fire barrier is required. Width: 1mtr. X 1mtr. & Also Available in 2mtrs. X 2mtrs.